magnacarterholygrail: durgapolashi: Eartha Kitt speaking truth… – Photojimsf!!! 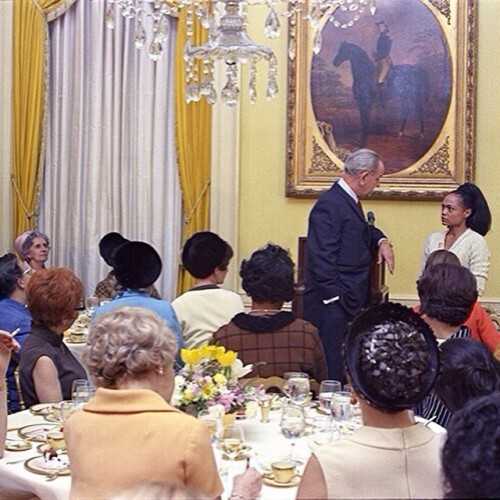 Eartha Kitt speaking truth to power at a 1968 luncheon at the White House hosted by Lady Bird Johnson which resulted in Kitt being blacklisted in the US for nearly a decade. let it be known that on January 18th, 1968, Eartha Kitt stood in a room full of white women at The Women Doers Luncheon, GOT IN LADYBIRD JOHNSON’S FACE, and told her that the government was sending the best of the youth off to be shot and killed and, in not so many words, that THAT was the reason the youth were rebelling. She ALSO stopped President Johnson after he made a statement claiming that mothers should be responsible for stopping their kids from becoming criminals and asked about “the parents who have to go to work, for instance, who can’t spend time with their children as they should”. It was brushed off by LBJ who only mentioned the funding for day care centers put in place by the recently passed Social Security bill, and then more or less said that the women at that luncheon should figure it out for themselves. She was blacklisted, but she defended every word she said that day.